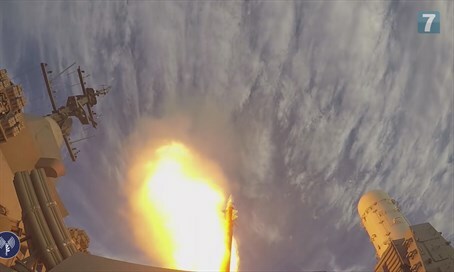 Head of the Israel Aerospace Industries (IAI) told Israeli press Wednesday that the newly developed ‘Barak 8’ system which will be installed on Israeli naval ships will be able to protect Israel’s offshore gas assets. Following the successful tests of the new system in India, Yossi Weiss, CEO of the IAI, said that part of the mission of the project is to protect the Israeli offshore gas assets. “Technology is giving us the answer to the unfolding developments and threats of our enemies,” he said in an interview with Walla! News. Weiss added that the system will also be used for “other naval assets." Weiss said the system is capable of providing an answer for a wide range of naval threats, including ‘sea-to-sea’ missiles and torpedoes, air to sea missiles, and land to sea missiles. The system itself uses advanced radar technology which is far superior to previous systems. The system also has a land based derivative which has been sold to the Indian Air Force. According to current plans between the two nations, that system will soon undergo testing as well. While the decision remains with the IDF as to when and how to install further systems, Levy added that the system could be fully operational on Israeli Naval ships in a matter of months. According to IAI standards, three successful tests are needed to certify a new program. The two trials which occurred in India in the past week, have completed the trial run phase for the ‘Barak 8’ system, and have classified it as ready for deployment.